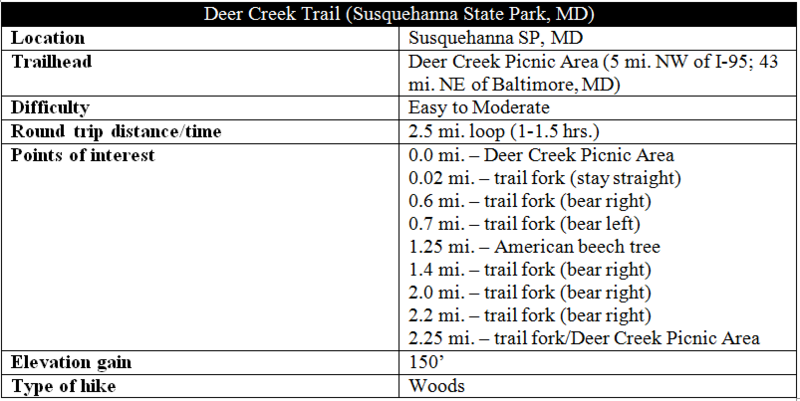 The Deer Creek Trail is, without a doubt, not the best trail in Maryland. It’s probably not even the best in Susquehanna State Park. 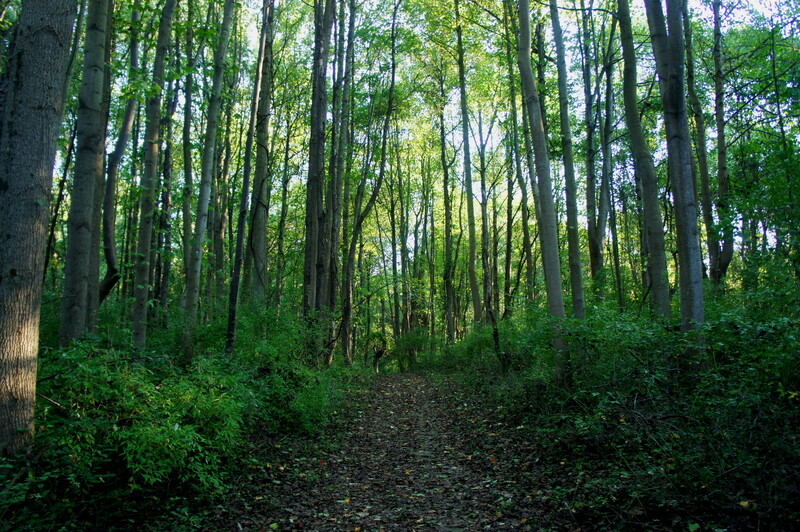 But there is at least something soothing about the surroundings on this largely wooded loop hike, situated just off the Susquehanna River in northeast Maryland. 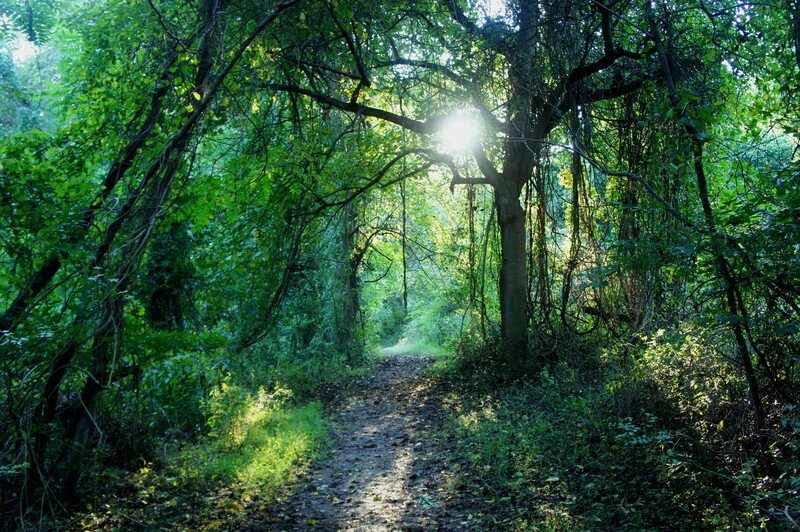 Here lofty trees, many devoid of branches, rise like sentinels above the damp, cool earth. The tranquil Susquehanna, though not visible, sets the stage for an abundance of bird and animal life, while the trail’s namesake creek carves steep hillsides, funneling rain water into the rushing stream. 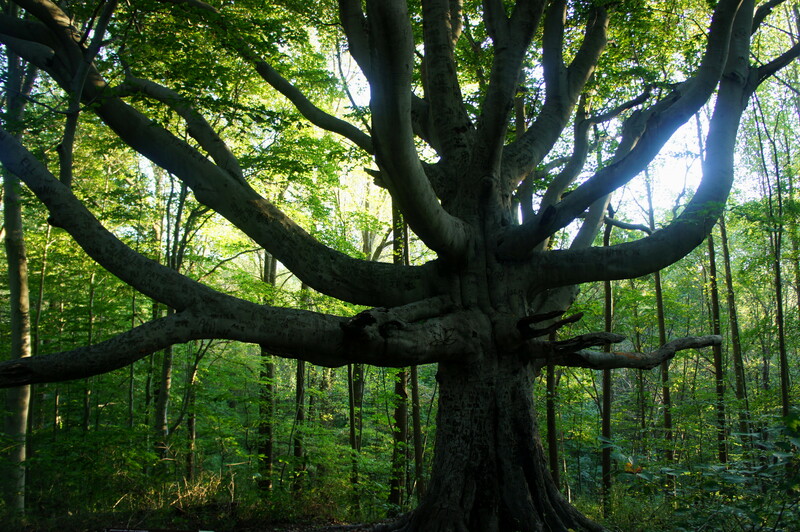 Amid the serene landscape is a surprising, hidden gem: an award-winning American beech tree, a woody behemoth with thick tentacles that is sure to foster the imagination. Susquehanna State Park is relatively convenient for passersby on Interstate 95, situated about halfway between Baltimore, Maryland and Wilmington, Delaware. (Note: Take Exit 89 to Havre de Grace/Churchville.) A number of country roads converge on the park, but it is Rock Run Road that cuts through the heart of the preserve, weaving through open fields before plunging into a sea of trees, darkened by the thick canopy. At the banks of the Susquehanna—and the end of Rock Run Road—turn left onto Stafford Road and continue northwest for 1.5 miles. Take a left again at the entrance to the Deer Creek Picnic Area; this is only one of many possible starting points for the Deer Creek Trail loop, but it is probably the most easily accessible. 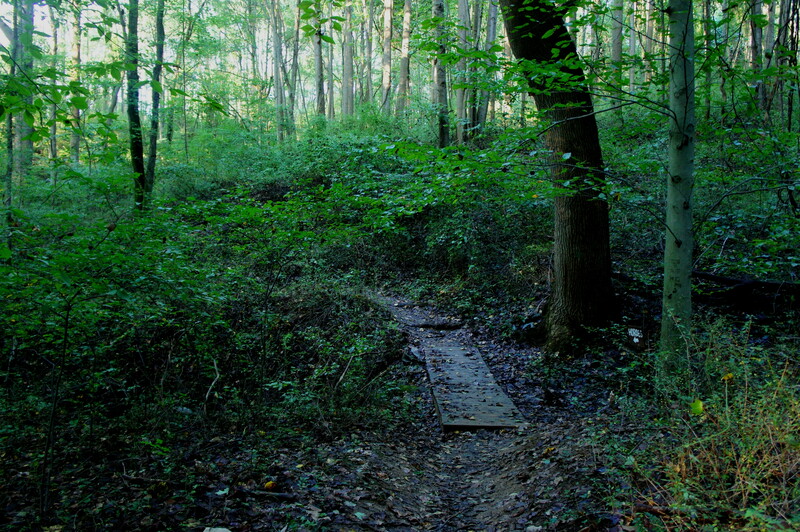 At around the hike’s highest point, the trail forks again, with a short spur heading right to the base of a gargantuan white oak tree, while the main path—now a narrow single-track—continues straight. From here, the trail tracks downhill into a ravine that feeds the Elbow Branch of Deer Creek. 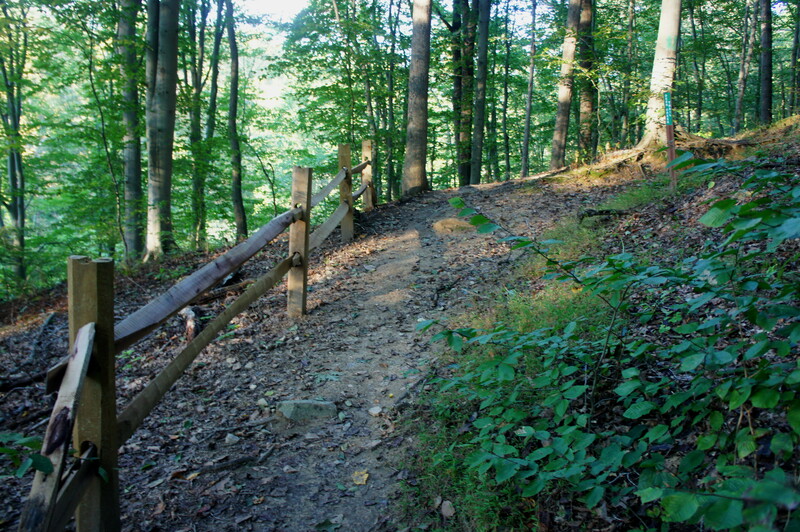 Stay right at the two forks—a pair of faint spurs provide access to the campground at 0.77 miles and 0.81 miles. Cutting sharply right, the trail descends in force, eventually crossing a small wooden bridge at 9/10 miles. What goes down must come up, and the Deer Creek Trail from here begins a sequence in which it climbs in and out of several small gullies. By 1.2 miles, the path has almost doubled back on itself, but then quickly cuts northwest and begins its sharpest descent yet. Around 1.25 miles from the start, the Deer Creek Trail flanks its main attraction on the left: the award-winning American beech tree. This hulking mass was a “Maryland Big Tree Champion,” meaning it was—at one point—the largest recorded tree of its species. Alas, it appears the beech has been bested in recent years, as other records list four other American beeches in Maryland as larger. In any case, the massive tree, which boasts dozens of robust branches, is an impressive sight. Beyond the beech, the Deer Creek Trail continues on its sharp declivity, finally abating at around 1.4 miles. Here the path rounds a right-hand bend and passes a spur that leads down to the Deer Creek Pumping Station, visible downhill to the left. It is around this point that the trail’s namesake stream also comes into view—though at a distance and obscured by the tree cover. 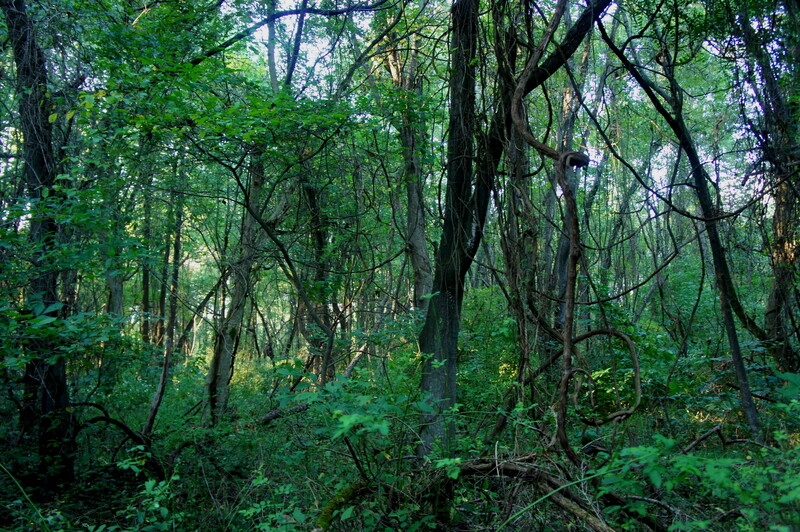 Heading northeast, the trail drops to clear a ravine then begins a steady climb, reaching nearly the top of a woody knoll before it descends again. Look for the remains of a short rock wall on the left at around 1.8 miles, a testament to the early settlers of the Susquehanna River area. At two miles, the path forks again (stay right), marking the start of the homestretch. Continue ¼ mile—staying right again at the next fork—to continue to the end of the circuit, arriving at the original four-way junction after about an hour to 1 ½ hours of hiking. Bear left and return to the parking lot. 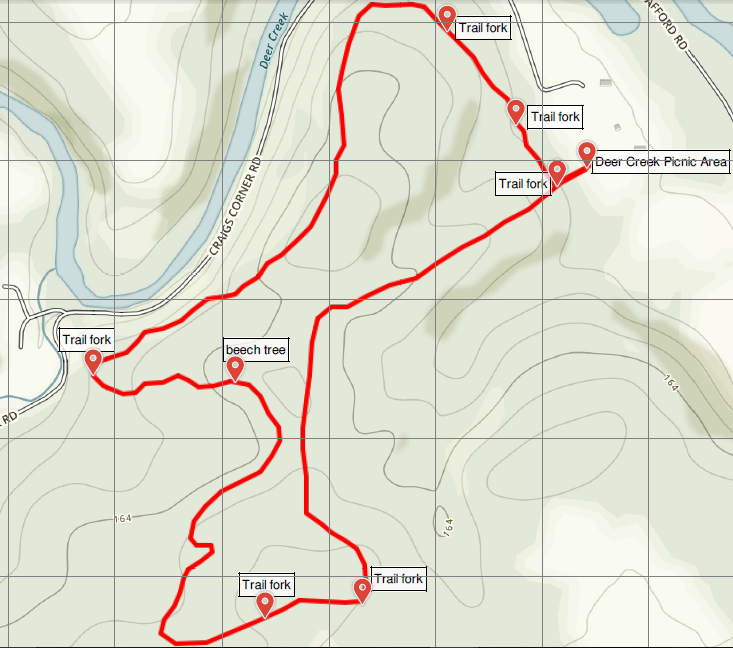 This entry was posted in Maryland, Susquehanna State Park and tagged beech, Deer Creek, Deer Creek Trail, loop hike, Maryland, Susquehanna State Park. Bookmark the permalink.